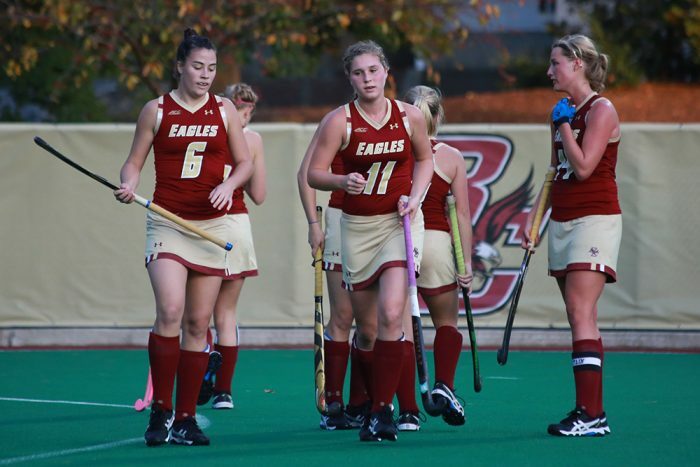 In July, Boston College women’s hockey assistant coach Gillian Apps left the coaching staff to enroll in the Tuck School of Business at Dartmouth. Fortunately for the Eagles, they got something in return from Hanover, N.H.
Courtney Sheary, who worked as the Big Green’s second assistant coach last season, will replace Apps on the Heights. In her lone season at Dartmouth, Sheary coached the defense under head coach Laura Schuler—a 1998 Olympic silver medalist and an assistant coach for the Canadian women’s national ice hockey team. But at BC, Sheary will take on a different role. The Winchester, Mass. native will deal with the offensive end of the ice, specifically the team’s forwards. Outside of Conte Forum, Sheary will handle the Eagles’ video scouting system and assist with the recruiting process, as well as other administrative duties. The 2017-18 season will mark Sheary’s return to Hockey East. Just six years ago, she was contending for another conference regular season title with her alma mater, the New Hampshire Wildcats. During her five years at New Hampshire, Sheary brought home four Hockey East regular season titles and three conference tournament championships. Overall, she suited up for 130 games and made three NCAA Tournament appearances. After she graduated in 2011, Sheary tried her hand at professional hockey. She was drafted by the Boston Blades of the Canadian Women’s Hockey League. But shortly after that, Sheary turned to coaching. Before she could move up to the collegiate ranks, she had to start somewhere—and that somewhere happened to be her high school alma mater, Cushing Academy. For five years, Sheary worked as the school’s assistant athletic director and coached varsity girls hockey. By 2014, she was the head coach. Following the completion of the 2014-15 season, Sheary moved back to New Hampshire to take the assistant coaching job at Dartmouth. Not even 30, Sheary has already turned in a successful career at New Hampshire and coached under an Olympic medalist. Eagles head coach Katie Crowley couldn’t pass up that kind of resume.